Remember Loo. Su. Mani and Pay. Mani? They are lower rung party workers (and part-time poster designers) and have given their bodies to the soil and lives to their leader (Udal Mannukku, Uyir Thalaivarukku). They recently had a discussion on the upcoming US elections, and I had the privilege to eavesdrop. PM: I am well, brother. Thalaivar’s posters stuckaa? LSM: Yes yes. From Ennore to Vandalur, our leader’s benevolent gaze confers bliss upon the city. PM: Good good. Did you hear about the elections in America? LSM: Yes yes. Some primary election is going on no? PM: Yes. To choose who will run in the election in November. LSM: Oh. For that also, election aa? Whatay waste of money ya. Why don’t they just choose a leader after the election? It’s not as if a single person runs the government right? So how does it matter who that nominal figurehead is? PM: No no. America is different. They drive on the wrong side of the road and eat super-sized fries with diet Pepsi. They are different. LSM: Oh. Appidi (like that). So what are the key election issues? LSM: What? Why is a woman’s private decision a public matter? PM: I don’t know. Something to do with a culture of life. LSM: So scientists cannot throw away petri-dishes containing live bacteria in the lab? LSM: Oho. And what else? LSM: Oh. What is that? PM: For e.g, 2 men getting married to each other. LSM: So what’s the problem? Let them do that no? Doesn’t it save money on jewellery? PM: I don’t know. Something to do with the sanctity of marriage. LSM: Oh. As if they are putting marriage in a temple and doing abhishekham daily. Don’t most marriages in the US anyway end in divorces? So where is the sanctity really? PM: I don’t know much about America but when I try to imagine a gay Tambram wedding, I can see a lot of potential administrative issues. For instance, what happens to the Kanya Dhaanam in a man-man marriage? Or all those mantras urging the couple to be fruitful and multiply? Will they now change it to “May you adopt many male children“? Which of the guys will go for the Kaasi Yatra? Will they both tie thaalis to each other? PM: Yes. I have always wondered about one thing though. How do they do booth capturing in the US? Does it work the same way it does here? LSM: No saar. In America, they don’t need to capture booths. They simply capture software. Specifically the one that powers these things. PM: Oh I see. By the way, did you see the rediff.com article on the US elections? LSM: Oh? There was a rediff article? PM: Yeah. And as usual I just completely skipped reading the article and went straight for the comments section. That’s where all the profundity usually lies. See here. The wisdom of the crowds in action explaining the key issues in the US election. LSM: Hmm. Profound indeed. So do you think Obama will win the nomination? PM: He should, but it’s a tight race. 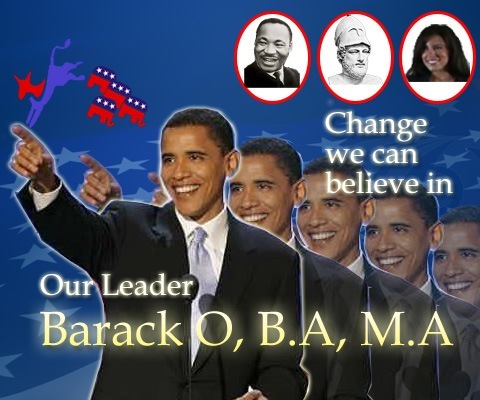 LSM: I feel Obama needs better posters. American graphic designers seem to lack the ability to deliver a punch. PM: What do you have in mind? Previous Previous post: Sodha Akbar says "Salaal Mugamaddhu baai, veg biriyaani ready"
lol… good one…but what’s the elephant doing on an Obama poster?? Or was it deliberate? Amrutha: The Donkey and the Elephant are the party symbols for the Republicans and the Democrats respectively. KA: O’ B.A, M.A ROTFL! Btw, who is that gal in pic? ayyo my evil mind is giving me tonnes of ideas…. 4 yaanaiyum oru kazhuthayum iruntha, kazhuthaikku votu podungannu solraru karuppannasaami – finger pointing see? change changenu, seriyana chillra aasaami! pi ku: aama, antha ponnu yaaru? mannnn!! O, B.A, M.A…pure genius kris, ash…o.k! 🙂 btw, we gotta have a rediff discussion board religion…we have too many followers amongst us but no religion to identify!! Maybe, modi can help! O, BA, MA.. too good machi..
Is that Monicaaa oo my dooorling? Who is the bearded greek with the helmet? Pericles?? What is the relevance? outsorcery. 🙂 man, you should compile a dictionary. will part 2 focus on Hillary? didn’t u claim to be a one-time-focus-only guy?! Ashok : Isn’t that your Managing Partner on the poster ? Any prizes for the correct answer ? Wow pok!! That’s too good. I got the relevance for the Greek chap, who I still think is Pericles. One of the great Democrats of ancient Greece. Ashok: I got sidetracked by the trivia last time. This post is superb. I have a minor quibbling point though. How could you forget to put in a picture of Lincoln? I mean, your Man is from Illinois?!! Ashok: It is Pericles. And I considered Lincoln, but then realized that he rode an elephant. laugh riot that bit on (alternative life style) tambrahm wedding! in short…thalaivaa….ungal sevai engalukku thevai…. I demand that a photo of Harbhajan Singh with a red X mark over him feature on the Poster. It would underscore Obama’s anti-weed and anti-racist views. HEY! What about us, Hillary supporters. Can we put in an order for Amma’s poster pliss?? ana wonly won koshan. if loo.su.mani is the official thug and pay.mani is his underthug, how come LSM addresses him as ‘big brother’? Ashok: Good point. Now after some considerable analysis, I have come to the conclusion that it was a slip and it really should have been “Ennalae” or “Ennada”. L.S.Mani and P. Mani sound like “Mary Figures” . Its ok I’ll swalpa adjust in my maadi. I found out recently that MLK had some rather segregationist things to say about Asians so maybe you should Oprah on the poster! adhu epdi adhu onglala mattun mudiyudhu?!! ROFL @ Bajrang boy. He’s awesome. Sorry to be so backward, but what is ROFL? Need to know, since the comments are as interesting as the original piece! LM and PM are quite a pair, though they do lapse out of their tanglish while discussing the gay marriages! Tambram gay marriages…. hmmm …. the mind boggles at the possibilities!! As maxdavinci says, I better get back to work! ROFL (Roll on the floor laughing)-am! KA: RJP (Romba joru pa)! Though ‘Kundrin mel Kumarans’ (‘ Young gayboys atop hillocks’ circa 2079, a la brokeback mtn awaits your penmanship). louwers names: swaminathan and ramanathan. I did ROFL reading your comment as well! When is part #2 getting bloglished?! We are geting impatient..!Days pass in prevision…darn. Love the poster! And the O., B.A., M.A. Your humor is original and cutting. I have become a regular reader here. Your appil ipod post made me popular with a bunch of folks, simply for taking the trouble of forwarding it to them. Go Obama Go! ( i reallydon’t care about it tho i’m Canadian……. Simply superb. You should listen to my 11 year old reading your posts(not this one!). He just cracks up… The Iyer vs Iyengar had him in splits.